Today marks 25 years since the Exxon Valdez struck Bligh Reef near Prince William Sound in Alaska. On March 24, 1989, the crippled oil tanker released nearly 11 million gallons of crude oil into the Sound, contaminating more than 1,300 miles of shoreline and severely damaging local wildlife. Prior to the Deepwater Horizon, the Exxon Valdez had been the largest oil spill in U.S history. 25 years later, Prince William Sound is beginning to show signs of recovery. Recent reports have shown wildlife populations like the sea otter, salmon and cod have returned to pre-spill numbers. Fishing fleets are returning to the harbor for harvest. Yet, there is still a long way to go to full recovery. The environmental and economic impact of the Valdez spill was a hard lesson, but one that has resulted in a number of changes over the past two-and-a-half decades around spill preparedness, tanker safety, and community involvement. In response to the Exxon Valdez incident, the U.S. Government passed the Oil Pollution Act of 1990 (OPA). The goal of OPA is to improve the government’s ability to prevent and respond to spills. As a result of the law, companies must have a plan to prevent spills, as well as contingencies for containment and cleanup should a spill occur. OPA also banned single-hull tank vessels of 5,000 gross tons or more, such as the Valdez, from entering U.S. waters as of 2010. Lastly, the law prohibits any vessel having previously caused an oil spill of more than one million gallons from operating in Prince William Sound. As of 2002, OPA had prohibited 18 ships from entering Prince William Sound. Human error was also found to be a factor in the Valdez spill. In an attempt to prevent future issues, crews of oil tankers are now receiving more training on equipment and procedures in the event of a spill. Works hours have been limited to reduce fatigue-related accidents, and crew members are subject to alcohol tests before sailing. Additionally, improvements in radar have led to a number of systems being developed aimed at monitoring ships. Vessels equipped with the Automatic Identification system send real-time location information to the Coast Guard. Ice-detecting radar has also been added to the area near Bligh Reef, known as SERVS, to warn tankers when ice may pose a threat to ships. Though a number of measures have been put into place to try and prevent oil spills, accidents do happen. One of the many reasons behind the extent of the damage after the Valdez spill included delayed action to prevent the spread of the oil. As a result, a number of procedures have been put into place to improve response time in the event of a spill. 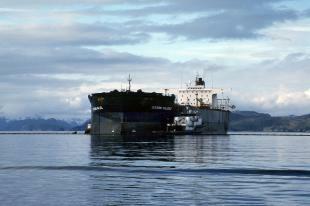 For example, powerful tug boats now accompany all loaded tankers from the Valdez terminal into the Gulf of Alaska. The tugs not only help guide the tankers, but are designed to begin cleanup if there is a spill. Citizens are also now guaranteed a voice in the oversight of oil transportation and safety planning in Prince William Sound through permanent, independent councils. These councils provide local vigilance and can help direct response in the event of an incident. Lastly, both communities and companies alike have expanded training efforts around oil containment and cleanup. Local fisherman receive regular training on spill booms and skimmers each year, in addition to companies like Exxon holding annual spill drills. A quarter of a century has not reduced the memory of the Exxon Valdez spill for the communities around the Prince William Sound. It has, however, led to improvements in prevention and preparedness that continue to make an impact on the shipping industry today.